Estimating physical properties of galaxies is a messy business. We can measure the light from galaxies, usually in the form of spectra, colors, or magnitudes. To convert these directly-observable measurements to physical properties, we have to use models of galaxies. Sometimes these conversions are relatively straightforward—for instance, the ultraviolet flux of a galaxy can be plugged into commonly-used formulas to find the star formation rate of a galaxy (the mass of stars that a galaxy forms per year). Sometimes these conversions are more complicated—one way to measure the stellar mass of a galaxy (the mass of stars in a galaxy) is to compare the galaxy’s spectral energy distribution to a library of simulated models and to find the closest match. Today’s paper presents a new way to find simple conversions from observables to physical properties. The authors of today’s paper use a large sample of synthetic galaxies from the Millennium cosmological simulation. For these synthetic galaxies, the intrinsic properties (such as stellar mass and star formation rate) are known, and the authors can model what they should look like in observations (galaxy spectra, colors, and magnitudes). They can then search for relationships between these synthetic observations and the physical properties of the synthetic galaxies. The age of a galaxy’s stars can complicate these relationships; a galaxy with young stars and a galaxy with old stars can look very different even if the rest of their physical properties are similar. To get around this, the authors first sort each galaxy by the observable spectral index Dn(4000), which is a measure of stellar population age. Then they use linear regression to find formulas for different physical properties. These properties include conventional measurements, like stellar mass and star formation rate. But the authors also define some new intrinsic properties: the star formation acceleration, which traces the rate at which the star formation rate changes; and the star formation jerk, which is the rate at which this star formation acceleration itself changes. 1) How do galaxies transition from the star-forming blue sequence to the passive red sequence? Blue star-forming galaxies eventually stop forming stars, becoming “red and dead” in a process called quenching (see this Astrobite and this Astrobite for more on quenching). But this isn’t a monotonic process—even quenching or quenched galaxies can have temporary bursts of star formation if they suddenly get an inflow of gas that can be used to make stars. To understand the blue-to-red transition, the authors look at galaxies that are in between the blue and red sequences. Figure 1 shows their main result: low-mass galaxies tend to be quenching, while high-mass galaxies appear to be bursting. This suggests that low- and high-mass galaxies evolve differently. Low-mass galaxies are being stripped of their gas when they accrete onto massive galaxies, and without gas they can’t form stars. Meanwhile, high-mass galaxies are receiving this gas from the low-mass galaxies and using it to make stars. Figure 1. Star formation acceleration (SFA) as a function of specific star formation rate (SSFR, defined as star formation divided by mass). 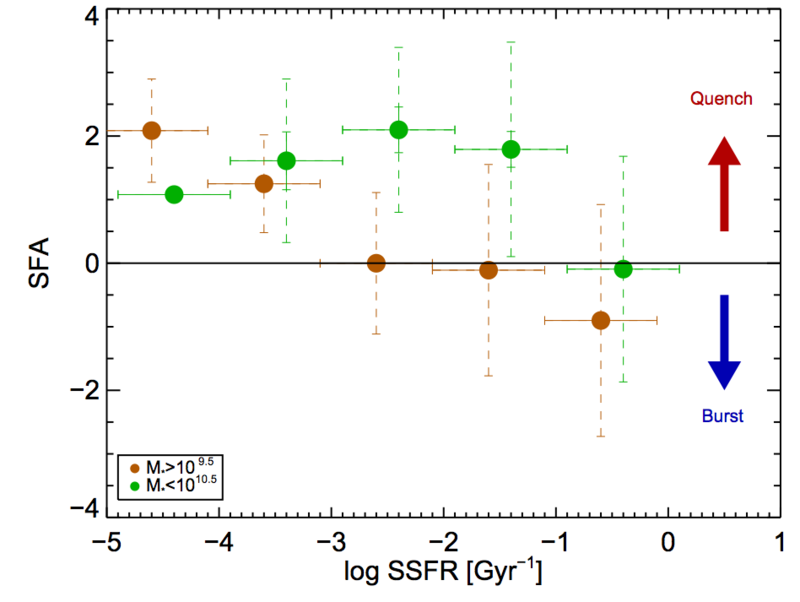 Green points show binned averages for low-mass galaxies, while the orange show high-mass galaxies. The low-mass galaxies are mostly quenching, while the high-mass galaxies tend to burst. 2) How do active galactic nuclei affect star formation? The supermassive black holes in the center of many galaxies can actively accrete gas, often producing energetic outflows as a result. So far, it hasn’t been clear whether or not these active galactic nuclei (AGNs) quench or trigger star formation. As shown in Figure 2, the authors find that AGNs may accelerate quenching—but this is a tentative result, one that needs to be tested in further detail with a larger sample. Figure 2. Same as Figure 1, but this time green points denote binned averages for non-AGNs, while orange denote AGNs. 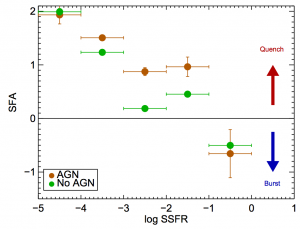 At low and high SSFR, there’s not a significant difference between AGNs and non-AGNs–but at intermediate SSFR, AGNs tend to quench more than non-AGNs. Today’s paper isn’t the first to propose using simple formulas to find galaxy properties from observables. But it’s the first to propose using star formation acceleration as a measurable physical property, and the preliminary results in this article are promising. Maybe star formation acceleration could be a key to improve our understanding of how galaxies change over time.